I must admit that Monday night's viewing of the coverage of the convention had my blood pressure pumping. BH and I both were talking back to the TV. Finally, I had to change the channel. And then Tuesday morning, this book landed on my desk. 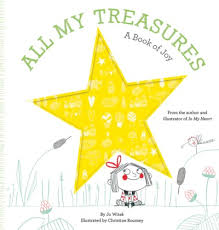 ALL MY TREASURES: A BOOK OF JOY is the story of a young girl who is given a special box by her grandmother, a porcelain box to hold all her treasures. But what to put inside? Giggles, rainy days, bubbles, and so much more go into this box of joy. I love the list of things that bring our protagonist joy. And it is a good place to begin this morning. So, what would go into MY box of joy? The crazy laughter that erupts when my conference roomies and I stay up way too late talking. That first utterance of "nana." The way my heart still flips when I look at BH. Those last moments I got to share with Meredith. Watching my grandmother play piano with such gusto. Family and friends would take up a huge portion of the box of joy. And, of course, there is a whole big box of joy when it comes to books and reading: figuring out HOW to read, going to the library with my mother, gifts of books, meeting authors, opening up the cover of a new book and inhaling the magic that awaits (right, Mr. Schu? ), sharing books and reading experiences with my reading community, having an extended community here on social media. Is it not terrific that, whenever I begin to feel down or upset, I can open this box of treasures and see my joy right there in front of me.